Child refuses to wear a bib? Try the black shirt hack! 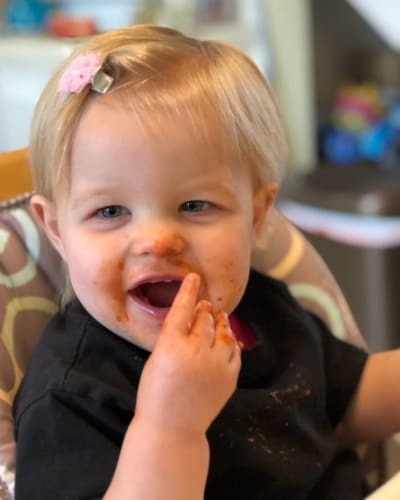 If you have a baby or toddler that refuses to wear a bib you need the black shirt bib hack! Save yourself a bunch of stained up clothes and a lot of fights by using this trick. I’d love to take total credit for this idea but for once my mother actually had a good idea. My daughter has always hated to wear bibs. She didn’t even want the drool bibs on when she was little. 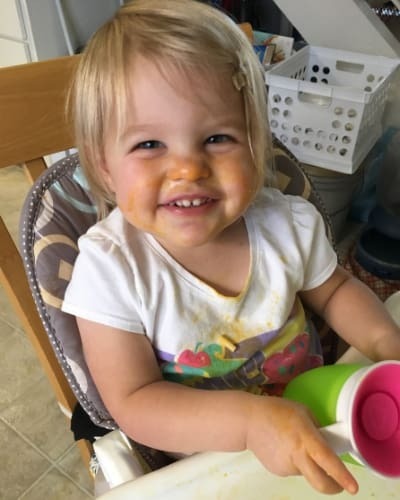 We started baby led weaning when she was around 6 months old and things quickly started to get messy. We tried a few different bibs and she would just pull them off or get upset. Plus, those plastic bibs are one more thing I have to try to wipe down after she eats. For a while, we went with no bibs but I got tired of constantly changing her clothes or trying to get food stains out. Sometimes I feed her in just her diaper but that still left a lot of clean-up or required a bath…which she also hates. One day my mom suggested using a black shirt and the black shirt bib hack was born! I purchased some plain black shirts from Amazon. I bought them one size up from her current clothing size. Before a messy meal, I simply pull a black shirt on over her clothing. When she’s done eating the shirt gets removed and thrown in the laundry. Then it gets washed with her dark clothes or our towels. I’m sure there are food stains on them but a black shirt doesn’t show them! This trick is great and inexpensive. It doesn’t require purchasing a bunch of plastic bibs to find one that works. It doesn’t require any DIY bib patterns and sewing skills. You will occasionally have to buy a new set of shirts as your child grows. They also double as smocks for when your child does any painting or crafting projects! These are ideal for on the go as well. I can easily keep an extra black shirt in her diaper bag for eating out or when visiting friends and family. Plastic bibs, especially ones with catch trays, can take up a lot of room or not fold easily for eating on the go. A black shirt is just a shirt so it doesn’t take up much space in the diaper bag. If the shirt gets soiled it can be placed in a plastic bag or folded with the dirty side in until you get home. Then simply throw it in the wash. I hope this trick works for you too! 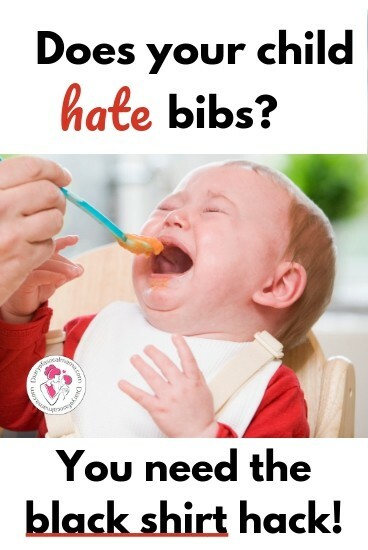 Let me know in the comments or share any solutions you have for kids that hate to wear bibs!